In development at the studio for quite some time, Warner Bros. Pictures appears to have found a director for their live-action adaptation of the anime classic Robotech. The Hollywood Reporter brings word that commercials director Nic Mathieu is now in talks to helm. 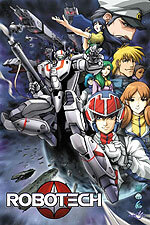 “Robotech” was a cartoon series during the 1980s from Harmony Gold USA and Tatsunoko Productions. It was re-edited and re-dialogued to combine three Japanese anime series to give the producers enough episodes to air as a daily syndicated series. A sprawling sci-fi epic, Robotech takes place at a time when Earth has developed giant robots from the technology on an alien spacecraft that crashed on a South Pacific isle. Mankind is forced to use the technology to fend off three successive waves of alien invasions. The first invasion concerns a battle with a race of giant warriors who seek to retrieve their flagship’s energy source known as “protoculture,” and the planet’s survival ends up in the hands of two young pilots. Writers on Robotech over the years have included Alfred Gough, Miles Millar and Lawrence Kasdan. There’s no word yet on whether or not additional talent will be brought in for a rewrite after Mathieu signs on. Akiva Goldsman, Joby Harold, Tobey Maguire, Matthew Plouffe and Tory Tunnell are attached to produce.